LOWER MANHATTAN — A tree that just barely survived the collapse of the Twin Towers on 9/11 returned to the World Trade Center site Wednesday as a symbol of renewal. "It is a testament to our ability to endure," Mayor Michael Bloomberg said as he replanted the now-flourishing callery pear near its onetime home. The tree’s survival, just like the city’s recovery from the attacks, was not a sure thing nine years ago. On 9/11, the falling towers crushed the tree’s branches, and the ensuing conflagration scorched its stump. Workers sifting through the debris did not unearth the charred remnants of the tree until weeks after the attacks, long after they had given up hope of finding anything alive in the rubble. "In those dark days, we felt we couldn’t disregard any sign of life," Bloomberg said. The Parks Department brought the 8-foot stump up to the Arthur Ross Nursery in Van Cortlandt Park in the Bronx and painstakingly coaxed it back to health with fertilizer and careful pruning. "It looked like a wounded soldier," said Richie Cabo, manager of the nursery. "When I first saw it, I thought it was unlikely it would survive." By the spring of 2002, though, green shoots poked through the trunk, and Cabo knew the "Survivor Tree" would make it. "It represents all of us," Cabo said. The tree faced a major setback last March, when it was uprooted during a storm. But the tree recovered yet again and grew to a height of 30 feet in time for its return to lower Manhattan. At Wednesday’s replanting ceremony, Keating Crown, 32, a worker at AON Corporation who escaped from the 100th floor of the South Tower before it collapsed, said the tree would remind visitors to the memorial of the thousands of survivors whose lives were forever changed by the attack. "It reminds us all of the capacity of the human spirit to persevere," he said. 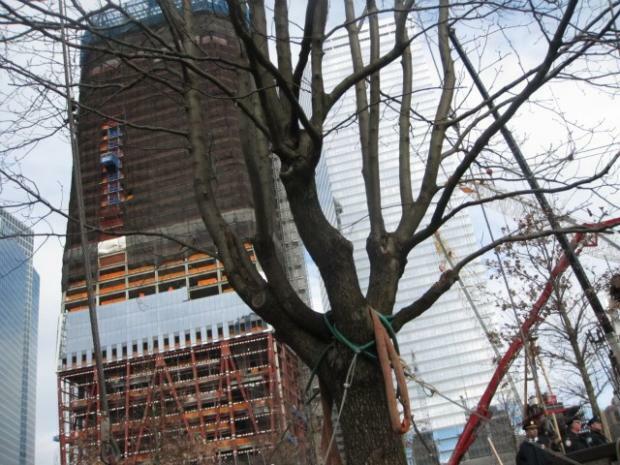 The Survivor Tree joins over 120 swamp white oak trees already planted at the World Trade Center site. The trees will begin shading visitors next fall, when the 9/11 memorial is scheduled to open to the public for the first time.